See our write-up in The Holmes Report here. 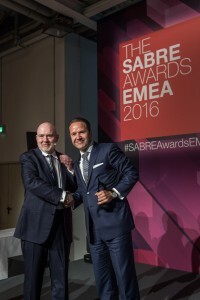 Berlin, May 25, 2016 – Hill+Knowlton Strategies has been named EMEA Agency of the Year at the SABRE Awards in Berlin. “This award, in a category with so many strong nominees, is testament to all the hard work and excellence of our teams across the region,” says Lars Erik Grønntun, President and CEO of H+K EMEA. “Since consolidating our Europe, Middle East and Africa regions two years ago, a lot of people have worked hard to take H+K in the region to the next level. By implementing our regional strategy of Connecting, Converging and Learning we’ve managed to take the agency to a new level, winning exciting new business, building stronger creative and content bids and strengthening our regional footprint,” says Grønntun. “Another important development is our proprietary 3P methodology, leveraging purpose-based thinking to build reputation and preference. This is tightly linked with our renewed approach to creativity – where our global creative hub in London is a driving force – and our step up in content creation,” Grønntun adds.